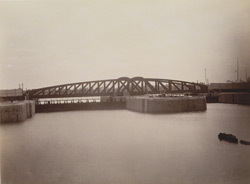 Photograph taken in 1891 by an unknown photographer of the Calcutta Docks with the swing-bridge gates at the entrance to the half-tide basin as seen from the river. The Calcutta Port is the only major riverine port in India and constitutes the Calcutta Dock System. In March 1884, the Secretary of State confirmed the adoption of the Kidderpore site for new docks. The entrance to the dock was to be through a tidal basin about 600 ft by 650 ft, and from the tidal basin to the river were two entrances, one 80 ft wide and the other 60 ft. In 1889-90, the tidal basin had been completed and brought into use, and dock number one was almost finished. The swing-bridges move on a central vertical pivot, allowing shipping to pass in and out of the half-tide basin which remains open for a few hours either side of high-tide.